CleanMail SMTP ports can be configured to use a built-in delay filter to block spam. The Delay Filter actually blocks up to 73% of all junk mails while causing only minimal resource usage on the host system. The concept of a delay filter was born out of the observation that most spammers and bulk mailers are an impatient lot, they do not wait for even a short period of time to see if a message will be accepted by a mail server at all. Basically the Delay filter works like this: the mail transaction is frozen for a short time period, and further processing (which may be rather costly both in terms of memory and CPU usage) is delayed. If the mail client disconnects during this time period, the message is simply discarded. 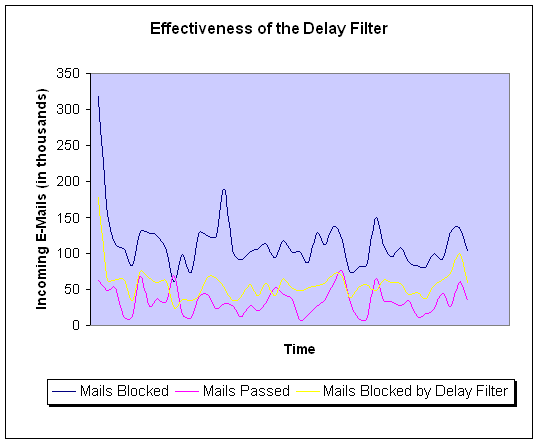 Tests have shown that the Delay Filter can itself already block up to 73% of all junk mails. This makes delay filtering even more effective than greylisting, and even better - Delay filtering at the same time completely avoids the infamous drawbacks of greylisting.